Want to skip the details and just make your teak look great again? Then go to our TeakGuard Teak protectant page. Teak is the most common wood found on pleasure boats, although many wouldn't use the word pleasure in the same sentence as teak. Teak wood contains natural oils which help prevent it from rotting or deteriorating in the marine environment. Unfortunately, these oils also cause teak to turn gray or black due to mold and mildew feeding upon the oil. On this page, we describe how to clean and protect teak. We also describe teak treatments such as oil, varnishes and sealers, and other non-traditional products such as TeakGuard. There really isn't any secret to cleaning teak except that it requires some elbow grease (nobody has figured out how to package that yet). There are basically two reasons to clean teak. First, you want to remove the black and/or gray color (actually mold & mildew) from the wood and get a more natural look. Second, you need to kill all the mold and mildew spores present so they won't continue to eat the teak oil and discolor the wood. Do not use a powerwasher - Powerwashers just blast away dirt and expose raw wood. Not only is this rough on your teak, it also doesn't kill the mold and mildew spores in the wood. Do not use household bleach - Bleach is not strong enough to kill the mold and mildew spores in the wood. Do not use tri-sodium phosphate (TSP) - As with bleach, TSP isn't going to kill the micro-organisms living in the wood. To clean teak, all you really need is a bottle of "teak cleaner". 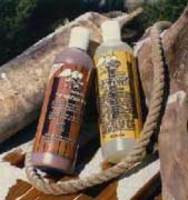 These products are formulated to kill the mold and mildew and restore the natural wood color. There are generally two types of teak cleaners, one-part and two-part cleaners. One-part cleaners come in a single bottle and use a mild chemical to clean the wood. We prefer one-part cleaners because they are much gentler on the teak wood and won't damage your boat gelcoat or paint. Because they are relatively mild, you need to work the cleaner into the wood. For teak wood that is in good condition, you may use a bristle brush or bronze wool. Do not use a brass brush. Using a brass brush will eat out the soft part of the wood and may produce a condition known as raised grain. For weathered wood, use coarse bronze wool to work the cleaner into the wood. Keep the wood wet for 5-10 minutes before rinsing. Rinse the wood with clean water and use bronze wool to rub the surface in the direction of the wood grain. This opens up the pores of the wood to remove all of the cleaner ensure that the wood is as clean as possible. Two-part cleaners come in two bottles and typically consist of a harsh acid and a neutralizer. The first part (the acid) chemically cleans the wood, killing the mold and mildew spores and removing the black and gray color. This step works faster and requires less work than for one-part cleaners, but the harsh acid also raises the wood grain (making your wood rougher) and can eat away your gelcoat and bottom paint. The second part is a neutralizer which counteracts the acid, allowing you to rinse off the teak safely. We generally discourage the use of two-part cleaners because of the damage they can do to your teak, your boat and the environment. After your teak is clean and dry, it's time to apply something to the wood to give it a nice appearance that (hopefully) will last. Teak oils penetrate into the wood and replenish the oil supply while teak sealers coat the wood and provide a barrier to the outside environment. These treatments have different advantages and disadvantages, so let's look at them in more detail. We'll also discuss TeakGuard, our recommended alternative to oils and sealers. Teak has traditionally been treated using organic oils, although an replacement for teak oil is available that overcomes many of the problems with organics. The organic oils replenish the oil removed from the wood by the environment and the cleaning process, restoring a nice satiny finish to the wood. Because the oils do not seal the surface, the treated teak is not slippery and is suitable for walkways, steps, etc. However, remember why the teak was cleaned in the first place. Mold and mildew spores were feeding upon the teak oil and turning the surface black or gray. When you oil teak, you are also providing more food for the mold and mildew. Consequently, you have to re-clean and re-coat your teak several times a season (on average). Another problem with organic oils is that they stain fiberglass, so be careful and use tape to mask off your fiberglass. Teak sealers try to seal the wood surface from the environment in order to maintain the appearance of the wood and (sometimes) provide a glossy finish. The traditional material for sealing teak has been varnish or polyurethanes. The main drawback with sealers is that they will eventually break down and begin to flake off. The sealer must then be sanded off (lots of work!). While sealers may look good initially, they can also require a lot of maintenance and even more work to remove them. We carry a unique product called TeakGuard that has a long lifetime but with easy maintenance. TeakGuard is a replacement for teak oil that has the benefits of traditional oils without the drawbacks. It prevents mold and mildew growth, you don't have to re-clean your teak. But it isn't a sealer either, so you'll never have to sand your teak.